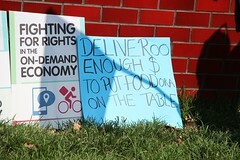 Riding a bike around the Wollongong CBD delivering food isn’t an easy way to make a few bucks. 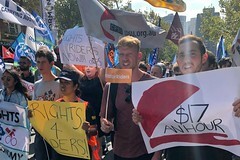 Delivery riders and supporters are taking to the streets in Sydney today to protest over low wages, which force 75% of riders below minimum rates, and over the lack of protections for injuries and abuse on the job. The protest comes as the Transport Workers’ Union files cases for unfair dismissal involving two delivery riders recently sacked. (CH10 The Project, 25 Feb 2018) An investigation has uncovered the much darker side of food delivery apps. Foodora rider Anvesh Kumar details how experienced a racial attack during a delivery. Foodora's handling of the situation highlights the vulnerability of the delivery workers. 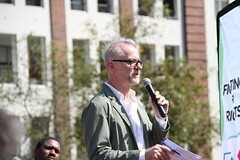 Critics say that the treatment the delivery riders from the apps are same as exploitation. Uber-style contract work is a bigger threat to future jobs in the $80 billion transport industry than automation, a new report has warned. More than three-quarters of Australia's growing army of bicycle fast food couriers are earning less than the minimum wage, the first study of the sector has found.